Many new phone models are 4G compatible. Many offers especially from Flipkart gives you an Airtel 4 G SIM card free with your new mobile phone. You can even order for a new 4G enabled SIM card from the official Airtel website. The company will courier you a new SIM card free of cost. 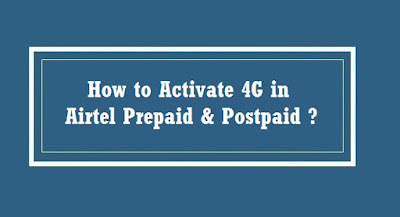 If you too have a new 4G Airtel SIM card, but don’t know how to activate it, we can help. 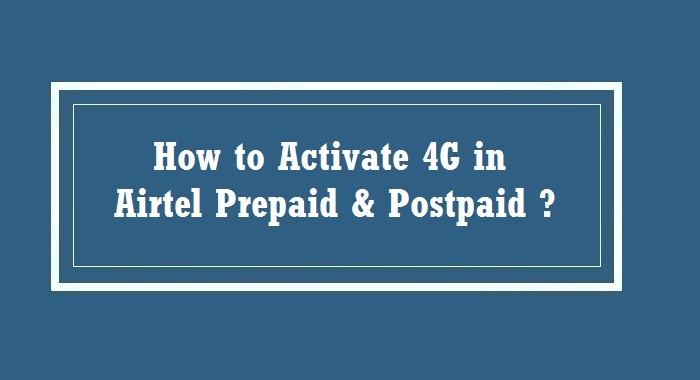 Let us see how to activate Airtel 4G SIM card. It is very easy to get an Airtel 4G SIM card, but there is no information whatsoever as to how to activate your new 4G SIM. If you insert your SIM card into your phone, it tells you need to activate your SIM card to use. But, how do you activate it? The following steps will tell you the easiest way to activate it. You need to type an SMS from your old Airtel SIM card. This means do not remove your old SIM card, until your new Airtel SIM card is active. Look at your new SIM card. You will find a 16 to 20-digit number printed in it. It is printed in quite a tiny font. So, make sure you read it carefully. Now, using you old SIM type an SMS ‘SIM New-SIM-Number’. For example, type ‘SIM 8991****************’ and send it to 121. In sometime you will get an SMS that says ‘Reply 1 to Confirm’. Type ‘1’ and send it to 121. Soon, you will get a message that says ‘Dear Customer, we have received your request for new SIM activation on Airtel mobile 9********* and will be processed shortly. Your old SIM will work till the new SIM gets activated. Please insert the new SIM in your device once the old SIM displays no network’. After about 5 to 10 minutes, you will find the network on your old SIM card is lost. This is the time you remove your old SIM card and insert the new 4G SIM card. You will have to wait for a few minutes more after inserting the new SIM card. Then, restart your mobile phone and your services will be activated on your new SIM card. That’s all you need to do to activate your new Airtel 4G SIM card you get with your new phone from Flipkart. Cloud Storage Vs. Local Storage: Which is Better?